Spettro sorts out a variety of insurance claims from flood, fire and storm to impact damage and burglaries. 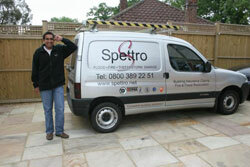 Spettro is also involved in property rental refurbishments and identifying the origin of water leaks. To date 17 Yellow Pages territories have been purchased. Spettro franchises should enjoy managing projects and be willing to help people in difficult situations.